James Fairman was one of several important Scottish émigré artists in America in the early nineteenth century. He moved to the United States from Glasgow with his family when he was only six years old. Fairman began formal studies at the National Academy of Design in 1842 and began exhibiting while still in his teens. He served as a colonel in the Civil War and, upon the War’s conclusion, opened a studio in New York City. 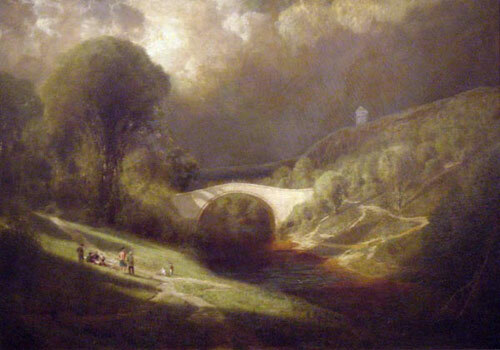 It is believed that one of his students was George Herbert McCord, whose landscapes, like Fairman’s, are characterized by dramatic lighting effects. In 1891 Fairman returned to Europe, where he studied and traveled extensively for the next nine years. In his recent book, The Landscape of Belief (Princeton, 1996), John Davis describes Fairman as the foremost American painter of Jerusalem in the 1870s. By the early 1880s Fairman had returned to the U.S. He painted for a time in the White Mountains and taught at Mt. Olivet College in Michigan. He died in NYC in March, 1904. Fairman’s works are in the collections of the Hudson River Museum, the Washington County (MD) Museum of Fine Arts, the Adirondack Museum, and the Minnesota Historical Society.